After finding out that we were placed in Al Ain, we waited with bated breath for our bus to take us to our new home. There was great anticipation on the bus from everyone, and we were all in high spirits. The bus ride from Abu Dhabi to Al Ain took about two hours – longer than expected, but purely because of the conservative driving – which was fine with us. When we started getting into the Al Ain region, the landscape changed into a more picturesque desert scene. Large dunes began to undulate past the small rows of date palms and desert shrubs. The sand took on a deeper reddish-brown, and as more time passed, there appeared more and more trees and greenery as we approached our new home. Driving into Al Ain city was a pleasant surprise. Just as we had anticipated, Al Ain seemed to be more of a community – a working city more in tune with the ebbs and flows of Emirati life than the hustle and bustle of Abu Dhabi. Whether it was the anticipation, the research I’d done, or the combination of the two, Al Ain seemed to be a more beautiful and well-manicured city. There were no more half-built towers and towering cranes everywhere we looked, but instead, there were homes, mosques, shops, and apartments. The irony of our move was not lost on us: We had moved from one desert borderland to another. It felt like an exotic homecoming to us as we entered into the city. We were driven through the Al Ain town center and marveled at all of the shops we’d be privy to in the next three years. We took special note of hole-in-the-wall restaurants and Shawarma places, drooling like Pavlov’s dogs every time we passed a window with the tell-tale vertical slab of meat and the stack of pita bread. 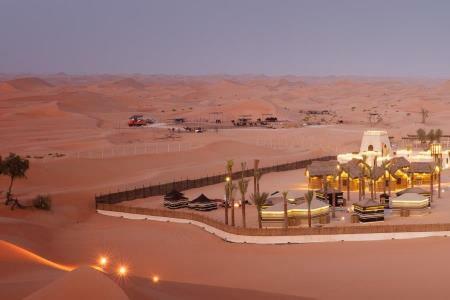 We were driven directly to Danat Al Ain Resort Hotel for what was to become our new home (at least for the time being). Being treated so kindly and generously by the Abu Dhabi Education Council (ADEC) has been a real eye-opener. Here, teachers are treated very well and are respected for what they can bring to the country – something that is certainly not completely felt back in the states. I am reminded that in the U.S. there is the awful saying of, “Those who can – do. Those who can’t do – teach.” Here, it seems there is the understanding that everyone succeeds when teachers are treated well – and respected for their commitment to educating the youth. David Jacobson is a father, husband, blogger, and experienced camper. His interests are traveling, art, family, and diverse cultural experiences. He holds an MA in Latin American and Border Studies, a BA in History with minors in Anthropology and Critical Thinking, as well as an AAS in Graphic Design and Illustration. All of these things come together to inform his work on Hiker Bible.